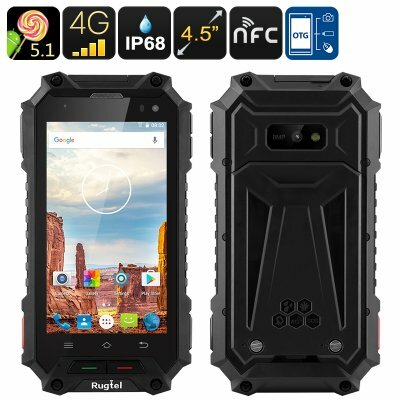 Successfully Added Rugtel X10 Rugged Smartphone - IP68, Dual SIM 4G, 4.5 Inch Screen, Quad Core CPU, 2GB RAM, NFC, OTG, SOS (Black) to your Shopping Cart. With the Rugtel X10 smartphone by your side, you can enjoy total freedom - no more concerns about getting your phone wet, dirty or accidently dropping it as the Rugtel X10 is equipped to handle the harshest conditions and keep on ticking. Its compact design features a 4.5 inch display that has the ability to respond to every touch, even if you're wearing gloves - now you can venture outside on those freezing days and needn't get your hands cold when interacting with this smartphone. The phones two SIM card slots deliver 4G connectivity as well as the standard 2G and 3G frequencies making for compressive network coverage - now you can enjoy better coverage across a wider area on the one device by loading up with SIM cards from multiple providers a real boon for first responders, outdoor adventures, keen travelers or those whose jobs takes them to remote and challenging locals. Ensuring you get the maximum support the Rugtel X10 has been equipped with a 3050mAh battery that delivers up to 9 hours of talk time or as much as 350 hours in standby so there's plenty of juice for when you need it most. With NFC you can use quickly exchange information or make secure payments letting you leave the wallet or cash cards at home. It features an advanced (push to talk) PTT function for faster communication access as well as an SOS button for emergency contacts. A rear facing 8MP camera lets you snap shots f your latest adventures or double for reporting on outdoor conditions if you job involves working outdoors. The Rugtel X10 Rugged Smartphone comes with a 12 months warranty, brought to you by the leader in electronic devices as well as wholesale Android Phones..